DeWain Valentine’s jewel-like cast polyester resin sculptures at Almine Rech, London, are an unexpected compliment to the Barbican’s survey of that prodigious Californian partnership, Charles and Ray Eames. Aside from being long-term adoptive Angelenos – wisened to the ways of smog-enhanced light and space – both artist and architects were, as Rowan Moore wrote of the latter, ‘the sunny side of the cold war and the fun side of the industrial-military complex’. Without a US navy contract for lightweight, modular leg splints they mightn’t have got started; prototyping of their now-ubiquitous moulded chairs coincided with military declassification of plastics following World War II. Valentine’s sculptures owe much, too, to military experimentation. He recalls being mesmerized by agate stones as a boy when his father, a government construction worker, relocated the family to Lander, Wyoming, a region littered with the bi-products of iron mining. On drizzly summer Sundays he’d walk the nearby aircraft bombing range, fire ceased for the day of rest, plucking stones extruded by blasts and washed by rain. Later, through a contact at a nearby Denver military base, Valentine’s junior high school teacher introduced him to newly declassified polyesters and plastics, which were easier to cut and polish than stones. Valentine admixed colour paints to fabricate any naturally occurring finish he desired. He made jewellery and at home baked plastics in the oven. ‘One day you’re gonna kill us all with that stink,’ his mother lamented. She was right to be suspicious: Niki de Saint Phalle is only the most famous artist to have died as a consequence of inhaling toxic polyester fumes. The foul winds had long departed the translucent columns and discs set atop gleaming geometric plinths at Almine Rech. Lining walls adorned with blooming pastel blushes on watercolour paper, these resin objects, dating from 1968–75, were now capsules of fairer climes, of palm trees, surfboards and the shimmering Pacific, of a more laissez-faire being: perfect for a drizzly October in Savile Row. The Light and Space movement, a name given to a loose association of South Californian artists in the late ’60s – among them Larry Bell, Robert Irwin, Helen Pashgian and Valentine himself – experimented with new industrial processes in pursuit of the purest expression of light and space. Christopher Knight, LA’s grandee critic, regards the movement as the city’s first wholly original contribution to art history, albeit one with a propensity for being misunderstood as parody – its interpretation of sunsets recalls Sunday painters in seaside colonies. Despite their cuteness, there’s something singularly American about the toxicity of their pastoralism. Working with a commercial plastics company, in 1966 Valentine developed his own polyester resin called MasKast, casting forms, sometimes metres tall, in wooden formers before sanding and buffing the surface with car wax for days and weeks on end. Materially speaking, these were something entirely new. A photograph shows masked men in overalls tipping resin from steel drums on a forklift. Are they the same steel drums washed up in John Gossage’s photographs of a festering Maryland pond? According to Leonard Pitt in his magisterial Los Angeles A to Z (2000), in the late 1960s and early ’70s, the aerospace industry accounted for nearly 43 percent of the region’s total manufacturing employment. Valentine’s technician previously worked for the Atomics Agency Commission. 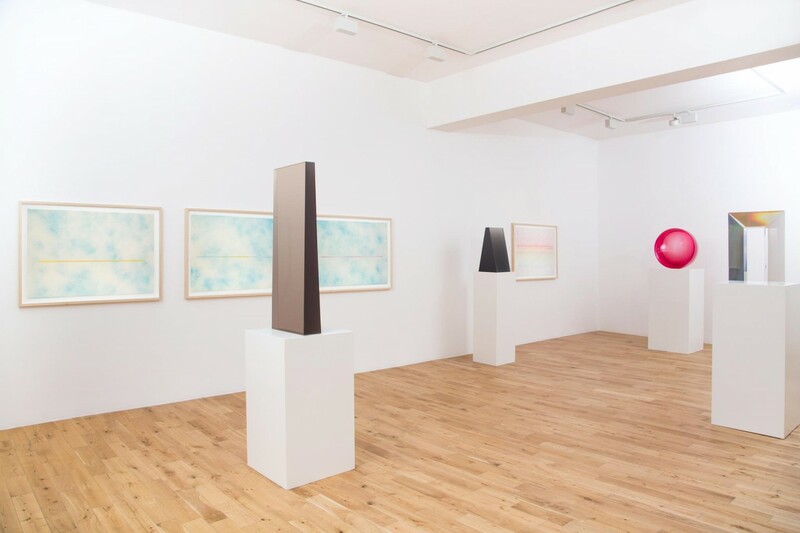 Clearly this streamlined aesthetic, which has also given us Apple Macs and iPhones, has been an influence on Valentine’s objects (and, according to some, so the gallery press release reads, his experience of working with UFOs). Derisively called ‘finish fetish’ for what some New York critics considered their superficial emphasis on surface, obsession with craftsmanship, and preoccupation with looking over thinking, Valentine’s light and space objects – not to mention his later watercolours – do look peculiarly contemporary from a remove of some 40 years. Those watercolours could be easy-on-the-eye Samara Scotts. Those shimmering, hermetic surfaces look like industrially produced Rafael Hefti sculptures or props in the videos of Loretta Fahrenholz or Shahryar Nashat. In George Orwell’s Coming Up For Air (1939) the middle-aged narrator, George Bowling, suspecting Great Britain has gone awry, returns to the village he was born in, now a large industrial estate. His suspicions are confirmed by the emergence of flashy new milk bars. ‘There’s a kind of atmosphere about these places that gets me down,’ he writes. ‘Everything slick and shiny and streamlined […] Everything spent on the decorations and nothing on the food. No real food at all. Just lists of stuff with American names, sort of phantom stuff that you can’t taste and can hardly believe the existence of.’ We British have a particular aversion to slickness. I believe it was us, nihilistic and fearful, who pioneered YouTube videos of the newest iPhones being smashed with a hammer or Nike trainers being cooked in the microwave.